Returning Aussie Sam Masters declared "it's all good" as Wolves leapfrogged Premiership title rivals Belle Vue to second place in the Premiership. 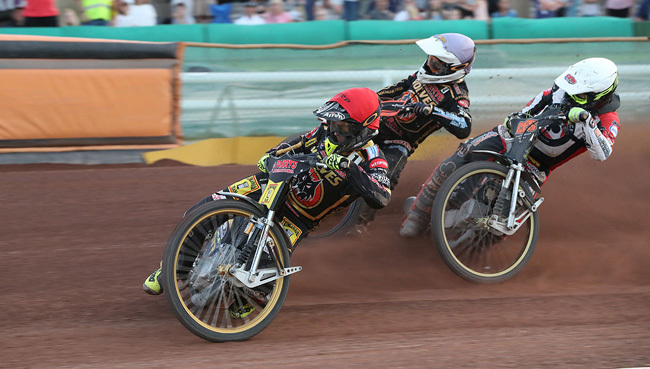 The Parrys International Wolves eventually pulled clear to take a 49-41 win over the Aces at a sun-drenched Monmore Green. Masters, back from a collarbone injury, found the going tough on a track prepared deep to cope with 30 heats, with Cradley also in action on the night. But he was happy enough simply to be back on the shale. “It's pretty sore, really,” he admitted after scoring five points. “It was tough and the track wasn't really suitable for it either. Belle Vue, hot-foot from a 50-43 defeat at Poole earlier today, played their full part in a see-saw meeting where there were never more than four points between the sides until heat 12. Craig Cook, Steve Worrall and hot prospect Dan Bewley all impressed but eventually their exertions exacted a heavy toll. Wolves, with skipper Freddie Lindgren quite superb in reeling off five wins and Jacob Thorssell and Rory Schlein both paid for double figures, had just about enough in hand to claim the spoils. They were eight points up going into the last and, inevitably, it was Lindgren who snuffed out the visitors' chances of a consolation point by beating off the hard charging Cook and Rohan Tungate. WOLVERHAMPTON 49: Freddie Lindgren 15, Rory Schlein 10+1, Jacob Thorssell 9+2, Kyle Howarth 5, Sam Masters 5, Mark Riss 4+1, Nathan Greaves 1+1. BELLE VUE 41: Craig Cook 12, Rohan Tungate 9+2, Steve Worrall 9, Dan Bewley 6+2, Jack Smith 3+1, Kenneth Bjerre 2+1, Max Fricke R/R.